Have you been thinking about introducing dry brushing into your beauty routine? Let’s back up a minute while I explain this new beauty trend. In essence, dry brushing is a combination of exfoliation and massage that involves taking a dry brush and moving it over your body in slow, circular motions. The firm bristles of the brush give your skin a complete exfoliation while the pressure helps to stimulate your circulation, eliminate toxins and ultimately reduce the appearance of cellulite. Yup, sign me up! 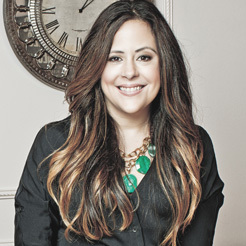 I understand you’re a busy mom and adding yet another step to your daily task list can seem daunting. But here’s the thing – simply introducing dry body brushing once or twice a month can make a huge difference from a beauty, health, and wellness perspective. 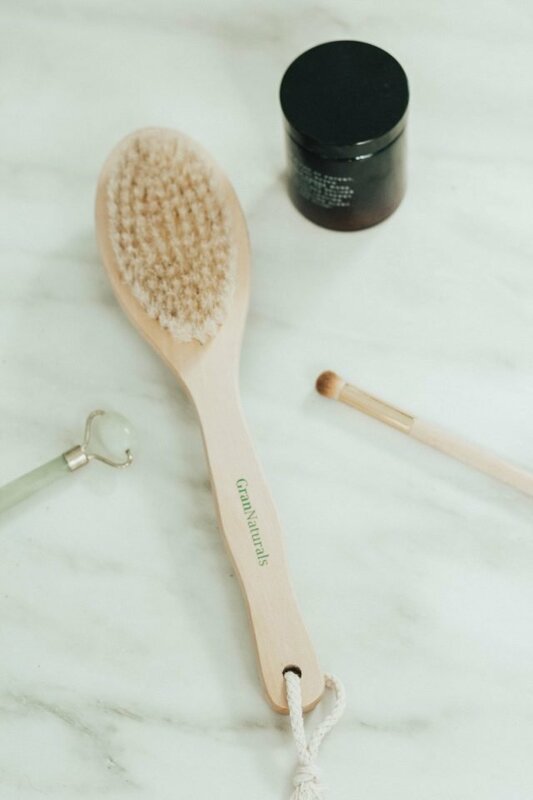 Read below for a step-by-step on how to properly body brush and the benefits of incorporating this hot-button beauty topic. Dry brushing is the act of brushing dry skin (without lotion or water, although you can use a little body oil if desired) to stimulate blood flow and exfoliate dead skin. Best of all, it’s a massage we can give ourselves using a long-handled brush. I recommend a dry brush with a long, sturdy wooden handle that has soft, yet firm bristles. This dry brush by Gran Naturals, $12.99, available via Amazon offers the right amount of pressure, support, and brushes nicely without irritating your skin and feeling too abrasive. I also like that this brush offers an additional stubby side that also aids in circulation and massage. As demonstrated below, I rotate between both sides when dry brushing to maximize the benefits of circulation and exfoliation. Dry brushing detoxifies and energizes by circulating your lymphatic system and removing dry, dead skin cells. In addition, dry brushing helps to make cellulite less noticeable as brushing helps soften fat deposits and make the skin look smoother and less dimple-y. Other benefits include increased blood flow to improve circulation, all-over body exfoliation, and stress reduction due to the relaxing nature of the massaging brush. Now, let’s start brushing from your legs up! Begin with dry skin. I recommend dry brushing before getting in the shower or the bath—ideally in the morning to take advantage of the blood flow. Starting at the ankles, work your brush upwards toward your heart. Gently brush up your legs with quick brush strokes. Next, brush around your knees and move up towards your thighs. 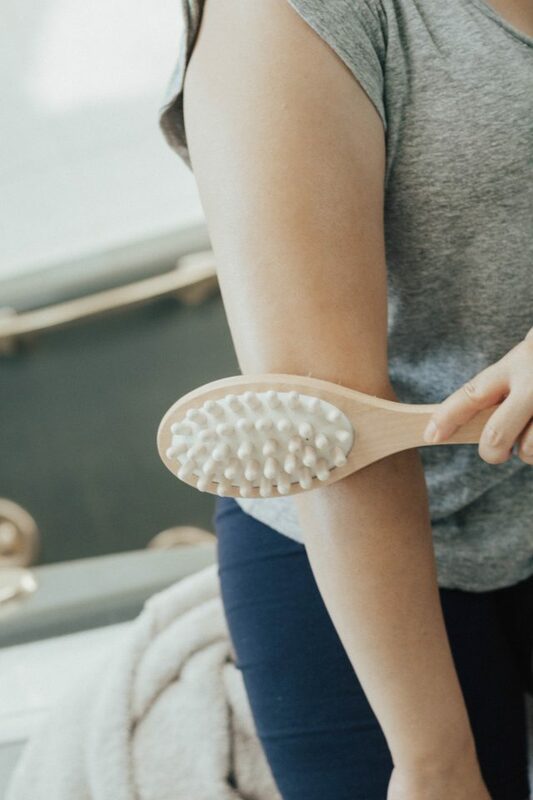 Dry brushing is a great way to exfoliate areas you might not normally reach like the back of your thighs—an ideal practice during seasonal weather changes. Next, brush your midsection, including your booty, hips, and stomach. Again, remember to brush upwards toward the heart. Then brush your arms, focusing on the elbows and the back of the arms. This is also a great way to reduce any little arm bumps you might have. Once you reach your chest, brush in a counter-clockwise motion and then brush along your neck. Dry brushing is also good for eliminating toxins in your body as brushing expels waste through your lymph nodes. Focus getting the back of the neck, too—an ideal move to soothe neck tension from hours spent in traffic, looking at your phone and sitting behind a computer. The whole process should take only a few minutes, but it makes a world of difference. It can even reduce stress which is a big win when you are trying to juggle work, dinner, homework, carpooling and child care each day. So are you a convert? Share your tips for incorporating dry brushing into your busy #momlife below. We’d love to learn your tips!